The Black Racer and Shilo Norman were minor characters in Jack Kirby’s Fourth World. The Black Racer appeared in a couple of issues of New Gods, a dark mirror of Kirby’s more well known creation, the Silver Surfer. The Black Racer was, effectively, the incarnation of death for the heroes and villains from New Genesis and Apokolips. Shilo Norman was a young boy who had witnessed a murder, and was brought to Mister Miracle to help him survive gangland reprisals, sticking around for the last few issues of the run to train in being an escape artist himself. Both characters were, obviously, black, but shared another feature that made them different from the rest of the Fourth World heroes. They were both humans from Earth. The Black Racer was a cosmic entity, to be sure, but he merged with a paralyzed man, Willie Walker, a Vietnam vet who had been shot trying to defend his neighbourhood from hoods. 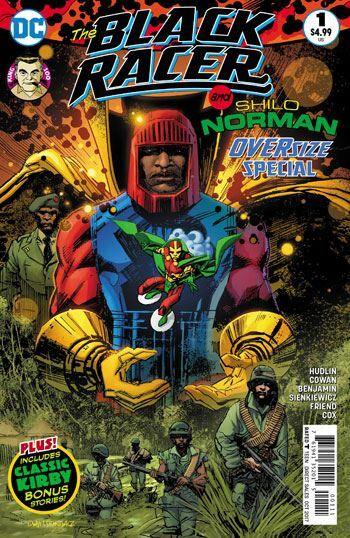 It is this shared feature, the fact that they are humans operating in a milieu of New Gods, that Hudlin builds his story around. Shilo Norman spends most of the story as the new Mister Miracle, performing an escape that has been rigged to ensure his death. The Black Racer shows up to “confirm” this and take Shilo to the other side once the death occurs. But neither man is content to let this take place, and both wind up fighting against the destinies. The story works very well, both as an introduction for readers who may not be familiar with the characters, and as a strong adventure for the two men. There are some moments of humour, but overall this is a fairly serious tale. Though the racial element is never brought to the forefront, I have a feeling there was a deeper level to the book that was intended, which does deal with it. The rigged escape that Mister Miracle must perform is a creation of a “casino king,” Travis Donald. In case anyone didn’t pick up the hint, the character is very explicitly drawn to be Donald Trump. Although this story would have been written before the events of Charlottesville, his white supremacist inclinations have been clear for quite a while. So it is possible to view the entire tale as a metaphor for the challenge of survival faced by black men in a nation where wealthy whites exploit and toy with them for their own amusement and profit, and the different challenges the two characters face to defy the manipulations, authority, and destiny which all seem to condemn Shilo to a certain death. Whether or not one chooses to view it that way, the story remains highly entertaining, with some brief but entertaining cameos by other Kirby creations, the world of Kamandi, and OMAC and Brother Eye. There are also three Kirby reprints, all installments of the Young Gods of Supertown feature that ran in New Gods. Two of the stories feature Fastbak, and one centres on Vykin, of the Forever People.